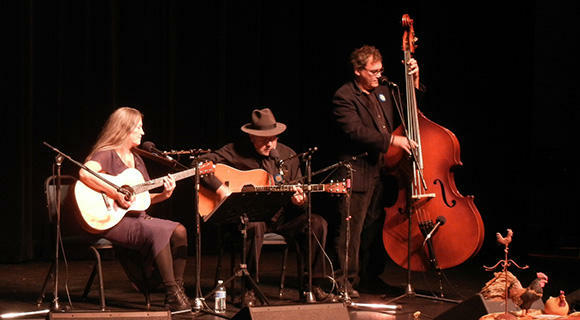 SPR took kids of all ages back in time to the old west at the April 11 KPBX Kids' Concert with Western Reunion. The four-piece band played a variety of great cowboy songs and western swing numbers. The concert started at 1 p.m. at the Bing Crosby Theater. The small screen at the top of the stage showed a slide show of images from the Old West, including Hollywood portrayals and sheet music of the classic songs. 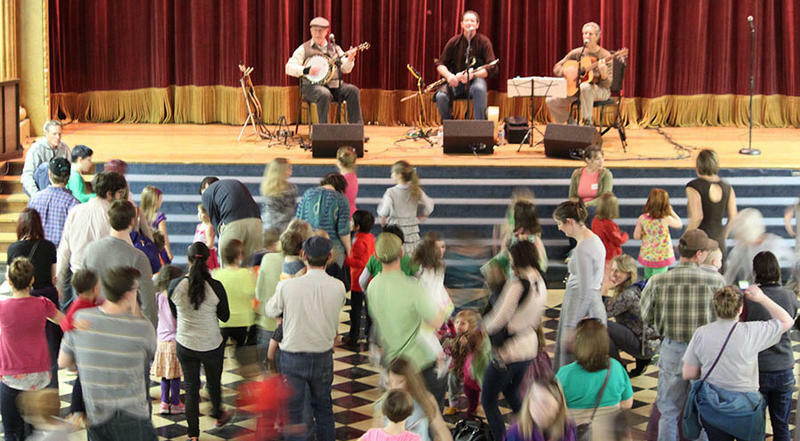 Young and Auld alike had a grand time at the March KPBX Kids' Concert, the Celtic Dance Party with Floating Crowbar. Three of the band's members -- James Hunter, Don Thomsen, and Rick Rubin -- kept the jigs, reels, and hornpipes coming from the stage of the Riverside Place Auditorium. 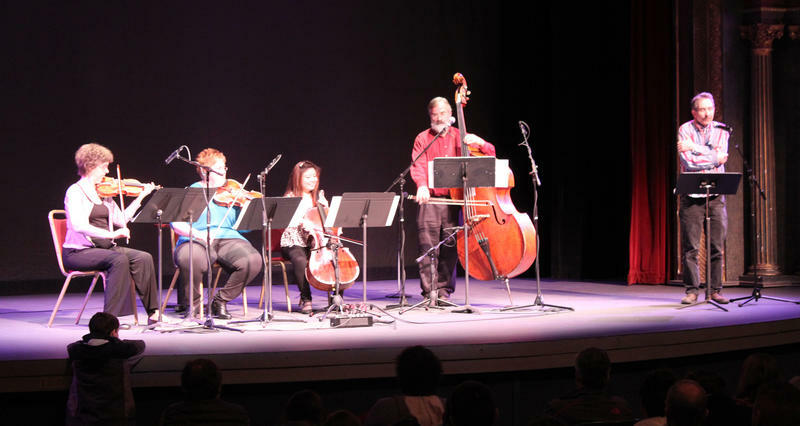 Four members of the violin family took the spotlight on Saturday, January 17 for the KPBX Kids' Concert with Sixteen Strings. The FREE, all-ages concert started at 1 p.m. at the Bing Crosby Theater, 901 W. Sprague Ave. Learn about one of America's most important eras, the Great Depression, and how it relates to feelings in this current economy at the next KPBX Kids' Concert on Saturday, November 22, from 1-2 p.m. at the Bing Crosby Theater. 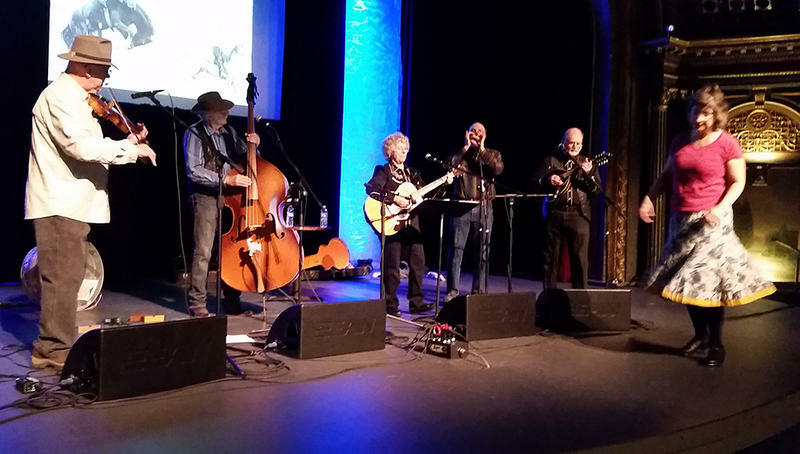 "Songs of Hope in Hard Times" showcases a collection of music from the Depression era, from Woody Guthrie to Hollywood and Broadway musicals. 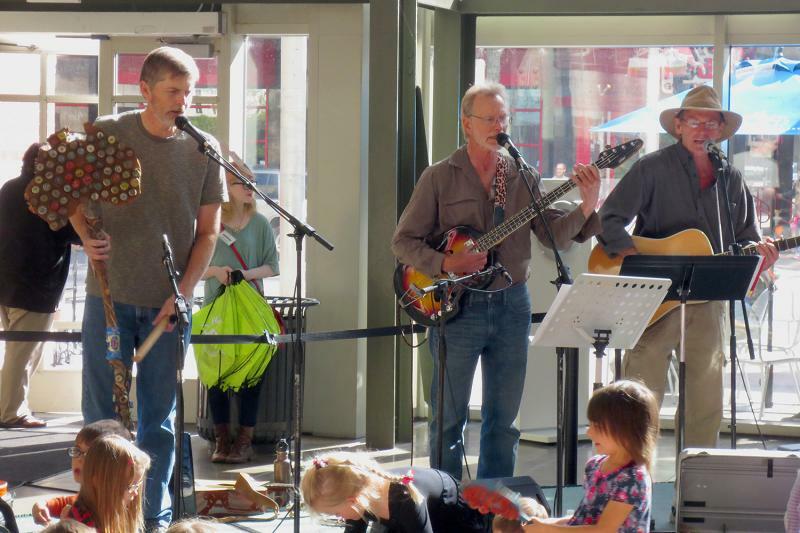 Songs of the Australian Outback and British Isles echoed through River Park Square on Saturday, October 4 as the Urban Coyote Bush Band performed for another KPBX Kids' Concert. Kids of all ages made musical noise with clappers, washboards, small cymbals, and the 'lagerphone' made out of bottlecaps. Kids also had help creating kangaroo headgear, a craft by the Mobius Children's Museum. 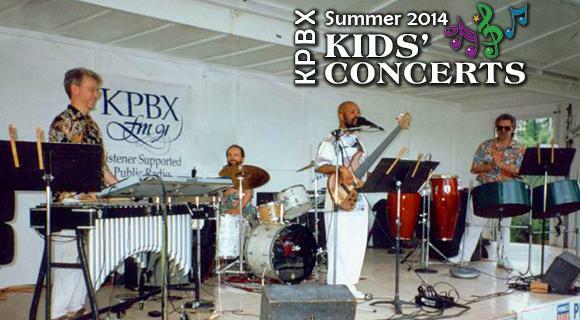 Kids and their adults bopped to the beat of the tropics at the Bing at the July 2014 KPBX Kids' Concert featuring Moko Jumbie. The free all-ages concert took place in the Bing Crosby Theater, 901 W. Sprague Ave. at noon on Friday, July 18, 2014. Moko Jumbie performers Bryan Bogue, Rick Westrick, Paul Raymond, and Angus Nunes presented the sound of Trinidadian steel drums, vibraphone, and other percussion instruments. Their music of the tropics is heard throughout the Inland Northwest. They also play rhythms from Brazil, including samba and bossa nova.